Peter Cushing | No Chic. Just Geek. 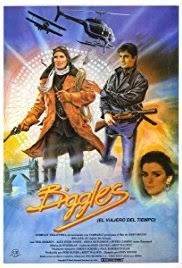 Movies are a bit more vulnerable at the scripting stage, of course, and a spectacular example of just how badly things can go wrong at this point appears to be John Hough’s 1986 film Biggles (released in the US a couple of years later, under the title of Biggles: Adventures in Time). Now, anyone familiar with W.E. Johns’ famous boy’s-adventure hero could probably have guessed that the producers of this movie had set out on a slightly rocky path: doing Biggles authentically would involve dealing with a lot of problematic material, mainly due to the character’s origins during the dying days of the British Empire – there are some fairly unreconstructed attitudes on display from time to time, if not outright racism. Nevertheless, you could certainly imagine a Biggles movie kind of working, provided it was sensibly scripted to catch the spirit of the stories – lots of courageous aerial derring-do, all in the cause of righteousness, naturally – in fact, you could imagine the 1983 Tom Selleck movie High Road to China serving as a template for a fairly successful Biggles film. And apparently Hough’s movie started life as just such a rousing period adventure, in the Raiders of the Lost Ark style. However, and this is the point at which the catastrophe started to unfold, while the film was being scripted – it may even have been while it was in production, such are the timescales involved – key figures on the project noted the success of various science-fiction films, particularly Back to Future, and the decision was made to try and attract the same audience to the Biggles movie. So it is that Biggles, a film supposedly about a British First World War flying ace, is primarily about Jim Ferguson (Alex Hyde-White), a New York City yuppie living in the middle 1980s. Ferguson’s job is running a company that produces fairly rancid-looking ready meals (he keeps getting dragged out of meetings by people declaring ‘there’s a glitch with the mashed potatoes!’) but his life is generally quite ordinary, except for the fact he is being stalked by a mysterious old man (a frail-looking Peter Cushing, giving it all he’s got). Well, all this changes one night when Jim, apropos of nothing much, finds himself in 1917, saving the life of a British airman when his biplane crashes (this, needless to say, is Biggles, played moderately well by Neil Dickson). And then he’s back in New York, none the wiser. This happens a number of times, until he decides to sort it all out by tracking down the old man, who seems to be connected to this odd phenomenon. Cushing’s character actually lives inside Tower Bridge in London, for no very good reason, and turns out to be Air Commodore Raymond, Biggles’ commanding officer during the war. This would make him about a hundred years old, and the uncharitable would say Cushing possibly looks it, but the film skips daintily over such things. Well, Cushing is saddled with the exposition, and reveals that Ferguson and Biggles are ‘time twins’ and that apparently ‘time travel is much more common than people think.’ This is the sole rationale for the movie, and not even Peter Cushing can sell it, I’m afraid. Anyway, every time Biggles is in danger, Ferguson finds himself plucked back through time to help him out, and spends most of the film ping-ponging back and forth. There is a plot about the Germans having developed a new weapon that delivers a devastating sonic attack (all together now: ‘You will feel dizzy, you will feel the urge to vomit’, and so on), which most of the action revolves around. And it is all almost indescribably awful. It’s not as infuriatingly, wilfully ugly as the Peter Rabbit movie, but this is the kind of film that made some people spend most of the eighties announcing the death of the British film industry. Cushing is the only person connected with this film who had any kind of movie career of note, and it was his last role. Everyone else has a solid background in duff TV, for it is full of faces from things like Allo Allo! and Roland Rat. Well, maybe I’m being a little too harsh on John Hough, who in addition to doing various episodes of The New Avengers and similar things also made Twins of Evil for Hammer and the original Witch Mountain movies for Disney. There’s a bit of a Hammer thread running through this movie, for in addition to the presence of Cushing and Hough, a Hammer subsidiary part-financed the film. It just shows the extent of the company’s fall from grace in the 1980s, I suppose. I mean, the film verges on the downright incompetent when it comes to things like editing and pacing, to say nothing of the tranquilised quality of most of the performances – Hyde-White is a particular offender in this department. All this just compounds the flaws inherent in the basic conception of the film, which crassly hedges its bets by attempting to combine swashbuckling adventure with time-travel fantasy and broad comedy: Ferguson keeps time travelling at inappropriate moments, so his friends discover him dressed as a nun (ho ho!) or he finds himself inadvertently machine-gunning the London police (ha ha!). The casual profanity in this film, to say nothing of the gags about breast implants, just feels horribly wrong for a Biggles movie, but the uncertainty of tone is pervasive – we go from moments of near-slapstick to a bit where Ferguson’s girlfriend (Fiona Hutchison), for no very good reason, claws an incinerated corpse’s eye from its socket. Even in the bits which seem vaguely historically accurate, the synth-pop soundtrack destroys any chance of atmosphere (this film contains Queen bassist John Deacon’s only recordings outside the band, which may mean it is of marginal interest to obsessive fans). The real problem with Biggles is that it doesn’t have an audience: I don’t mean that no-one would be interested in a film based on this character (I think that a serious film based on the earliest stories, which are darker and grittier, could be really interesting), but that the structure of the story is so slip-shod and weak it appears to be aimed at undemanding children, while much of its substance is clearly pitched towards a much older age-group. The result is a strikingly incompetent film with a very broad lack-of-appeal; other than Queen aficionados, it’s only likely to be of interest as Cushing’s final (non-CGI) big screen appearance, and even in those terms it’s a horribly unworthy valediction for the great man. I’ve thought for a long time that there’s nothing more comical than a botched attempt at a horror movie, and few things more guaranteed to chill the soul than an inept comedy film. By this logic, then, comedy-horror films are particularly odd beasts, because you have to get both things right, and in the appropriate places, too. Film-makers who attempt to hedge their bets by putting a few funny bits in what’s supposed to be a horror movie are taking a big risk, and when they come a cropper it is frequently spectacular. 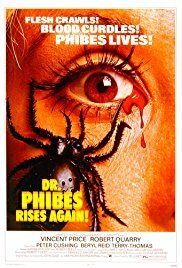 On the other hand, when it works, the results are often something quite distinctive, which sort of brings us to the case of Robert Fuest’s 1972 film Dr Phibes Rises Again, a sequel (rather self-evidently) to the previous year’s The Abominable Dr Phibes. Wikipedia lists this movie as a horror film, plain and simple; the IMDB takes a more cautious position and pegs it as ‘comedy, horror’. None of this really does the peculiar tone of the movie justice. 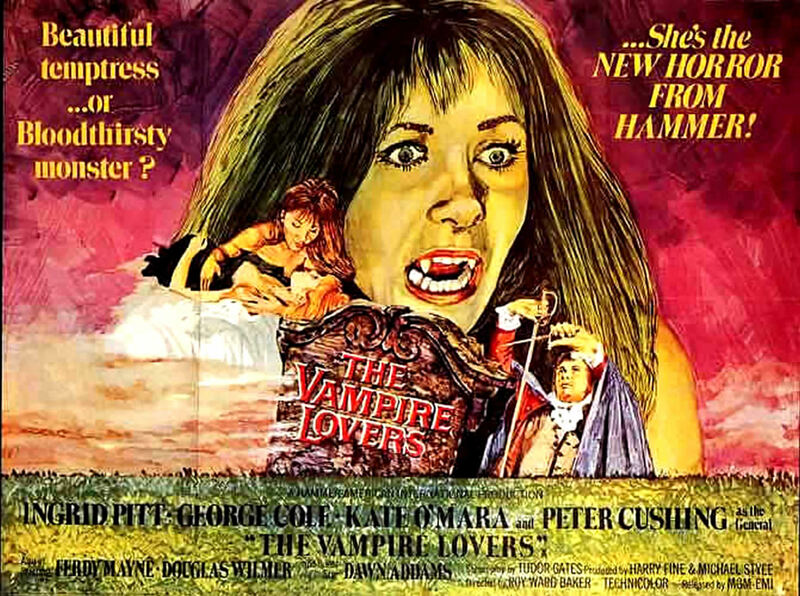 We open with a brief recap of the first film, and the murderous revenge-spree undertaken by the insane genius Dr Anton Phibes (Vincent Price, obviously) – theologian, organist, inventor, and general man of many parts – against the doctors he blamed for the death of his wife (Caroline Munro, not doing a great deal). The film concluded with Phibes eluding the police and putting himself into suspended animation alongside his wife, in preparation for the hour of his return. And, of course, said hour has now come. The sequel opens with Phibes rising from his sarcophagus, and – just to get things off on the right foot – he proceeds to do a little light dusting around his crypt, before rattling off a few organ arpeggios. As you would. From somewhere or other he summons his glamorous assistant Vulnavia (Valli Kemp, this time around), his plan being to use an ancient map in his possession to find the River of Life which runs through the basement of a secluded Egyptian temple. The River of Life will apparently resurrect Mrs Phibes and give the pair of them eternal life (whether it will allow Dr Phibes to grow a new face is not made clear). However – zounds! – in the years since the first film, Dr Phibes’ house has been demolished and the map stolen. Luckily the doc knows exactly who would be in the market for a relic like that: Darius Biederbeck (hmm, like that’s a real name), played by Robert Quarry. Biederbeck is also searching for the River of Life – it eventually transpires that he has managed to enormously extend his own life by (presumably) alchemical means, but his means of doing this are almost exhausted. He will soon be departing from London for Egypt, where he will lead an archaeological dig to the hidden temple. Well, Dr Phibes steals the map back, killing Biederbeck’s servant in the process (lest you think the film has adopted too quotidian a tone, he does so using a basketful of clockwork snakes and a trick telephone), and everyone departs for the valley of the Nile (which is played by southern Spain), with Phibes and Vulnavia leaving a trail of bizarre killings behind them. The police eventually cotton on to the fact that Dr Phibes is back in action, and top detectives/idiots Waverly (John Cater) and Trout (Peter Jeffrey) are dispatched in pursuit. You could argue with some merit that many of these early-seventies Vincent Price movies are basically just strings of set pieces held together by rather basic plots – watching The Abominable Dr Phibes or Theatre of Blood, it quickly becomes apparent that these movies are about Price having a hit list of victims, which he is going to work his way down in his inimitably outlandish style. Dr Phibes Rises Again does depart from this formula, but only to the extent that Price has another agenda, and just ends up killing people who get in his way. (New characters are written in solely to facilitate the set pieces – John Thaw turns up, gets savaged to death by Phibes’ pet eagle, and is barely mentioned again after the one sequence he appears in.) It is, I suppose, a little more plot-driven, but that would give the impression that the plot, or indeed the film, actually makes sense as a conventional, naturalistic narrative. It does not – and lest that sound like a criticism, I think it was never really intended to, nor is this particularly a problem. Unlike the first film, the sequel does appear to include a genuine element of mysticism or the supernatural, in that Biederbeck does seem to have achieved a degree of immortality, but even without this, nothing about this film is remotely credible. It’s almost like a rather gory cartoon in which the laws of physics themselves have been suspended for the duration: not only is Phibes able to booby-trap the dashboard of someone’s car so they are sandblasted to a skeleton while driving along, he manages to do so in about five minutes flat. It would be ridiculous if it weren’t all so knowing and tongue-in-cheek: the Price horror movies of this period come closer than most to managing to be funny and scary at exactly the same moment. That said, while Price and the returning cast members all seem to be in on the joke, some of the others aren’t, which can be problematic. Peter Cushing turns up for one scene (he is credited as a ‘guest star’), which he plays entirely straight; the part isn’t really worthy of him. Interesting to imagine what would have happened if he’d played Biederbeck instead – Robert Quarry had recently appeared in the bad-but-influential Count Yorga movies and was apparently being groomed as a new horror star by AIP, but isn’t remotely in Vincent Price’s league. (Legend has it the two had an acrimonious relationship – when Price came upon Quarry singing in his dressing room, Quarry said ‘You didn’t know I could sing, did you?’, to which Price replied ‘Well, I knew you couldn’t act.’) About the best thing you can say about Quarry’s performance in this film is that he is not actively bad. Biederbeck is written as such an odd character, and performed so flatly, that it’s hard to tell if he’s genuinely meant to be the hero of the movie or not. As it is, you end up – well, not quite rooting for Phibes, but certainly wanting to see more of him and the ridiculous costumes and death-traps and other gadgets that invariably surround him. There’s a sort of cheery amorality about every aspect of this story, certainly no sense of moral outrage – every death is there to be enjoyed. The ending, with Phibes seemingly triumphant, Biederbeck defeated, and Price giving us a technically anachronistic rendition of ‘Somewhere over the Rainbow’ as he vanishes into shadow, doesn’t feel downbeat or a case of evil ascendant. But then this movie is not much concerned with good or evil, just with its own peculiar style. Perhaps it’s better to consider this film as a collection of individual moments, intended to amuse and distract, rather than as any kind of plausible story. As such, Dr Phibes Rises Again is rather entertaining, always assuming you are on its wavelength. Sometimes I could almost believe the people at Lovefilm are reading this blog and sitting in judgement upon it. One of the unusual (and, to my mind, rather enjoyable) aspects of my soon-to-be-defunct DVD rental service is the random nature of it – you basically get very little control over what films from your list they decide to send you. Is there some sort of lucky dip system in effect at Lovefilm HQ? Somehow I doubt it, for there have been several occasions when I have received a string of suspiciously similar films in a row. On these occasions I can almost hear a spectral voice saying ‘We enjoyed your review of that last Woody Allen film. Have another one.’ And my thoughts on Tales from the Crypt seem likewise to have earned the approbation of the DVD gods, for landing on my figurative mat this week was another Amicus portmanteau horror movie – the daddy of them all, in the form of Freddie Francis’ 1965 film Dr Terror’s House of Horrors. All I can say is: DVD gods, please send Tiptoes before your service closes down. Anyway – yes, this is the one with Fluff Freeman and the killer vine. This was the original Amicus portmanteau, and as a result it does feel a little less formulaic than later films in the subgenre. Scripted by Amicus head honcho Milton Subotsky, apparently the film originated in the late 1940s, with the script hanging around for fifteen years or so before it finally went into production – scholars of American horror movies of the mid-40s have suggested that all the segments of House of Horrors are to some extent derivative of other movies and stories from that period, but this is not especially obvious to a modern audience. The movie opens with a group of men gathering in a train compartment, and you do get a sense almost at once that this isn’t a film completely trapped in the horror ghetto – true, you do have Peter Cushing and Christopher Lee giving their legendary imprimatur to proceedings (although both are somewhat cast against type), but there’s also a very young Donald Sutherland, not to mention all-round entertainer Roy Castle and the disc jockey (and not very good actor) Alan ‘Fluff’ Freeman. Something for everyone there, I’m tempted to say. First up is Werewolf (the segment subtitles leave a little to be desired, if you ask me), a slightly overplotted tale of an architect (Neil McCallum) who returns to his recently-sold family home to do some surveying work for the new owner (Ursula Howells). Soon enough he discovers the coffin of a legendary sorcerer and werewolf, the magnificently named Cosmo Valdemar, walled up in the cellar, and recalls old tales of Valdemar’s undying hatred of his family. Better start melting down the silver crucifix to make bullets, then… but is there something else going on that our man is not aware of? The least you can say about any of the stories in House of Horrors is that they are atmospherically filmed, and this one is no exception. However, each of them also stands or falls on the strength of its punchline, so to speak, and the question of exactly what’s going on here always seems to me to be a little confused. Or, to put it another way, you don’t really expect to have to work out the plot of an Amicus portmanteau story for yourself. Hey ho. No such worries in the next one, The Creeping Vine – yes, the time has finally come. One of the distinguishing things about this film is that it’s not about dodgy types receiving their well-earned comeuppance, which is basically the rationale of later films like Tales from the Crypt, Vault of Horrors and From Beyond the Grave – it’d be a stretch to describe any of the protagonists here as actually wicked, they’re petty or foolish at worst. And yet their fates are uniformly pretty grim. In this case, Fluff Freeman plays a very ordinary bloke who comes back off holiday to find a peculiar vine has sprung up in his garden. The vine violently resists any attempts at pruning, which is enough to prompt Fluff to head off to consult some boffins. ‘I’m pretty good at handling garden tools, I don’t think those shears slipped!’ says Fluff to the experts (I can’t understand why that line has not become one of the most celebrated movie quotes in history). The boffins (Jeremy Kemp and Bernard Lee), who obviously have far too much free time, speculate that rather than being a gardening mishap, this may be evidence of a sentient mutant plant having appeared, and one of them actually moves in with Fluff to investigate. Well, who’d have guessed it, but the boffins are right, and soon the malevolent vine is strangling family pets and covering the whole house. Bernard Lee brings remarkable gravitas to an uproariously silly story, all the more so given he was apparently so much the worse for drink during most of his scenes that he had to deliver his dialogue sitting down. Fluff, meanwhile, just stands around looking slightly bemused by the whole thing. Very entertaining, but hardly the high-point of the British botanical horror tradition, and once again the ending is just a bit too ambiguous. Next up is Voodoo, the tale of Roy Castle’s hapless jazz trumpeter (it’s Roy Castle, of course he’s going to have a trumpet), who is sent off for a residency in Haiti along with his band. We’re heading into slightly problematic territory here, with Haiti depicted as a hotbed of black magic and voodoo (Castle’s attempt at a West Indian accent at one point is also rather embarrassing), but the casting of Kenny Lynch allows the film to undercut the stereotypes a little. Castle is much taken with the music of the local voodoo ceremonies and plans to arrange it for his jazz group, despite the objections of the local houngan, who insists it is ancient and sacred to his god Dhambala. ‘Oh, well, if it’s that old, it’s out of copyright…’ says Castle. Needless to say the playing of the music leads to unfortunate events back in London. A slightly lighter tone to this one, mainly because of Castle’s deft comic performance (hard to imagine first-choice actor Acker Bilk being quite so capable), if (a pattern develops) the climax is a little underpowered. A really good performance from Lee here, who is miles away from his traditional kind of role – here he plays a vain, foolish man who gradually succumbs to terror as the hand’s relentless attempts at vengeance go on, and on, and on. The crawling hand prop is actually rather impressive, given this is not exactly a big-budget film – the hand would go on to have a fairly distinguished career in other Amicus productions, playing one of Richard Greene’s severed hands in Tales from the Crypt, for instance. A strong ending, too, finally. I think this is a fairly witty little story, provided you don’t know the twist going into it. Not a great showcase for Sutherland, though, partly because while his character may be a qualified doctor, he’s also depicted as rather a dim bulb, but mainly because Sutherland gets bulldozed off the screen by Max Adrian, here playing the town’s other doctor, one of those actors with a tremendous capacity for stealing scenes. Then it’s time for the final twist of the framing story. Now, as I’ve observed before, the thing about the Amicus portmanteaus is that the final twist is nearly always the same in all of them, but bearing in mind it would have been new and original on this occasion, I think it’s a reasonably good way of ending the movie. All in all, Dr Terror’s House of Horrors feels rather less schlocky and threadbare than some of its successors, possibly because it’s not principally based on American horror comic books (as a couple of the other films were). Derivative it may be, but its choice of subject matter is sound – a vampire, a werewolf, a crawling hand, voodoo magic, and a killer plant… again, something for everyone here – and the film has an interesting mixture of styles. The werewolf story is properly gothic, the vine is more of an SF B-movie, the voodoo story is somewhat played for laughs, and so on. This, along with the extraordinarily eclectic and interesting casting, gives the film a real sense of variety and colour. 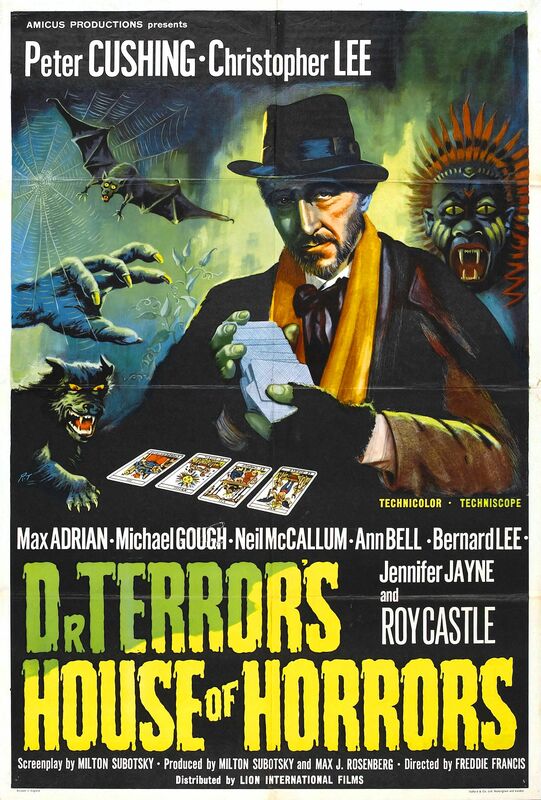 You can see why Amicus and many others have endlessly reused this formula in the years since Dr Terror’s House of Horrors was made, but this film has a touch of class almost all the others lack. So, just recently I was writing about the vital contribution to my education which was made by the main commercial channel’s tendency to show endless old genre movies in the middle of the night, back when I was a teenager. Doesn’t happen these days, of course: even old movies are now too expensive, given there are a dozen other channels in the market for content, so the wee small hours are the domain of rip-off phone-in competitions and ultra-cheap home-grown repeats. And, as it happens, just the other day I was writing about the fractured dream-logic of a certain kind of horror movie. There is something oddly satisfying about the way these two themes combine in Freddie Francis’ 1972 film Tales from the Crypt. Or should that be Milton Subotsky’s Tales from the Crypt? Subotsky is one of the (largely) unsung heroes of low-budget British genre movie-making of the 1960s and 1970s, most frequently through his company Amicus. Amongst other things, Subotsky oversaw the two 1960s movie adaptations of a famous BBC fantasy series the name of which I will not utter here, and the first few Trampas movies (the last one, Warlords of Atlantis, was the work of other hands). But if Subotsky left an indelible mark on the fabric of cinema, it is in the form of the portmanteau horror movies which he oversaw both at Amicus and elsewhere. He was not the first to make this kind of movie – I suspect that credit goes to Dead of Night, made in 1945, and widely credited as the best of the subgenre – but if you stumble across one of these, the chances are it’s one of Milton’s. Subotsky was not the kind of man to mess with a successful formula, and it must be said that most of these films are rather samey, to the point where they all start to merge together in one’s head after a while. When an Amicus portmanteau comes on the TV, I have to take a moment to work out if this is the one with Fluff Freeman fighting the carnivorous vine, or Tom Baker misusing his voodoo paintbrush, or David Warner contending with a haunted mirror. Tales from the Crypt is not any of these, in case you were wondering (oh, what delights remain as yet unconsidered by this blog). This one opens in classy style with a bit of Bach’s toccata and fugue on the organ and some shots of a cemetery. Geoffrey Bayldon, soon to appear as a homicidal psychiatrist in the next Amicus portmanteau, Asylum, plays a guide showing a group round the cemetery catacombs. Five of them get separated from the rest, and find themselves in, well, a crypt, with a robed and hooded figure (Ralph Richardson). One thing about the moribund state of the British film industry in the 1970s, you got some heavyweight actors appearing in slightly suspect material. This is, as the title would indicate to the in-the-know, a fairly low-budget movie based on some disreputable American horror comics – a proper slab of schlock, not to put too fine a point on it. And yet it has Ralph Richardson, an actor from the same bracket as Laurence Olivier, Alec Guinness, and John Gielgud, and apparently taking it quite seriously. And he is not the only big name to appear. Well, anyway, each of the five characters appears in their own short tale, revealed to them by the enigmatic Crypt Keeper. But is he showing them their future or their past? Some effective jump scares in this one, I suppose, and it’s an especially camp segment of what’s a rather camp overall. The contrived plotting and particularly fake-looking fake blood (all the Kensington gore in this film is completely the wrong shade of red) just add to the fun, but it’s just as well this is the hors d’oeuvre in this particular collection. Well, the thing is that this one is so short and so insubstantial that it barely stands up to even a cursory review. If it were any longer it probably wouldn’t work at all – as it is, some slightly gimmicky direction and the re-employment of the ‘endless nightmare’ idea from Dead of Night just about keeps it afloat. You might wish for Ian Hendry to get some more substantial material, but you take what you’re given in this particular genre. Another textbook example of Peter Cushing deploying his powers to their full extent to lift some rather dubious material. There’s also the added poignancy of the recently-widowed Cushing taking on this role – I couldn’t help noticing that his character’s dead wife has the same name as Cushing’s own partner, and I’d be prepared to bet this wasn’t a coincidence. Sometimes you think you understand just how much this loss defined the last two decades of Peter Cushing’s life, and then sometimes you suspect it’s impossible to fully appreciate that. Oh well. Onto Wish You Were Here, in which another ruthless Tory type (Richard Greene) finds himself financially embarrassed and on the verge of serious debt, at which point his wife discovers that a mysterious statuette they bought in the Far East has the power to grant three wishes. Any self-respecting viewer will at this point groan ‘Oh, no, not The Monkey’s Paw AGAIN,’ but the movie earns a degree of respect for having the characters also be aware of WW Jacobs’ famous cautionary tale and actively try to avoid making the same mistakes as their counterparts in the story. It doesn’t help them, of course, and the film earns bonus points to go with the respect, for finding inventive ways for their ill-considered wishes to screw them over. So, the guilty all get punished in suitably outlandish style, and all that remains is for the twist of the frame story to be revealed. I say ‘twist’, because another of the defining features of the Amicus portmanteaus is that the final twist is almost always the same, and hardly difficult to guess if you pay any attention whatsoever to what’s been going on in the film. 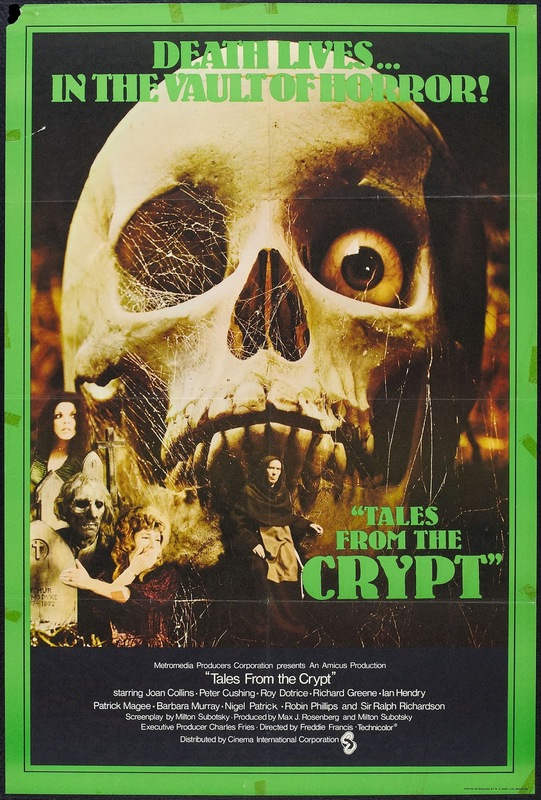 I really don’t know about Tales from the Crypt: by any objective standard, it’s really quite a bad movie, with silly stories, obvious twists, and unconvincing fake blood, lifted only a bit by the presence of some properly talented actors. The same could really be said for most of the other, similar films produced by Milton Subotsky. And yet it also manages to be quite marvellously entertaining. If 1970s British horror movies are not your thing, you should probably give it a very wide berth, but if they are – well, you probably already know what to expect. Hardly a great film, but – for some of us – great fun. If you think of British film companies of the 60s, particularly makers of genre movies, then of course you think of Hammer, then probably Amicus, and perhaps Tigon in third place. It might be quite a long time before you remembered Planet, a much smaller outfit these days best remembered for a couple of Terence Fisher films – Island of Terror, from 1966, and Night of the Big Heat, from 1967. Island of Terror was a moderately successful monster movie, rather let down by ropey monster props and a slightly stuffy tone. Night of the Big Heat (also known by the rather more promising title Island of the Burning Damned) almost looks like an attempt at a remake with these things fixed. Eventually we get some sense of the set-up here. Key locations on Fara include the weather station and the gravel pits (a useful location for staging mysterious deaths and the climax), but most of the action takes place in the pub, which is run by slab-faced alpha-male novelist Jeff Callum (Patrick Allen) and his wife Frankie (Sarah Lawson). Lodging in the pub is mysterious outsider Dr Hanson (Lee), while constantly propping up the bar is genial GP Dr Stone (‘guest star’ Peter Cushing). New on the scene is Jeff’s latest secretary, Angela (Merrow), who is a bit of a naughty minx: she and Jeff have history together, if you know what I mean, and she’s come to Fara intent on resuming their liaison. A torrid time is in prospect. Especially torrid given the island is sweltering in the grip of a tremendous, unseasonal heatwave, which is making TV sets and bottles of beer spontaneously explode. (All the men have had ridiculous sweat-patches applied to their shirts by the costume department.) What’s going on? Does it have anything to do with Dr Hanson’s experiments? Well, sort of. It seems that space probes from Earth have attracted the attention of alien creatures composed of ‘high frequency heat’ and they are using Fara as a beachhead for their invasion of Earth. Anyone who crosses their path – sheep, supporting characters, those old tramps who are such a regular feature of this kind of movie – is rapidly incinerated. Is everyone doomed? 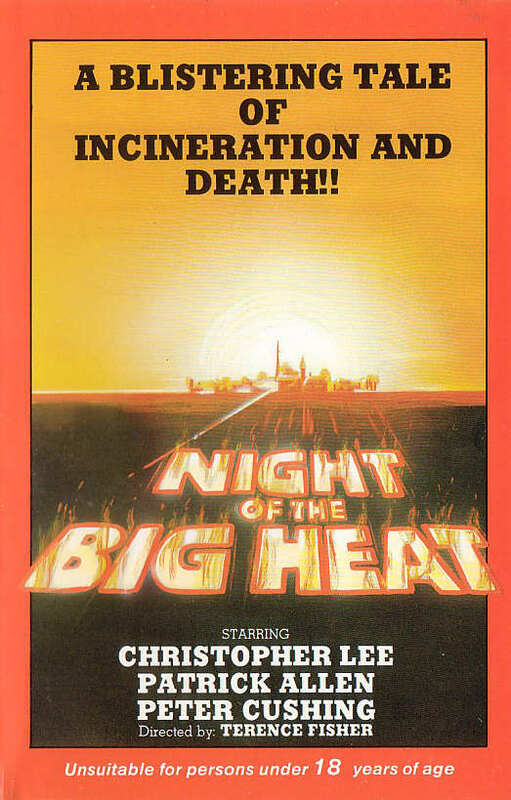 The least you can say for Night of the Big Heat – you know, I do think Island of the Burning Damned is a better title – is that it more or less avoids the key problems that Island of Terror had: the alien monsters are kept off-screen for most of the movie (and the monster props are marginally better when they do appear), and the general tone of the thing is pepped up by some mildly saucy business between Allen and Merrow (not to mention Merrow providing some cheap PG-rated cheesecake thrills). And yet this is still a worse movie than the previous Planet production. However, at least this makes a vague sort of sense, which is more than you can really say for the alien monster invasion storyline, which starts off as slightly dubious and rapidly becomes very silly indeed; this is the kind of film you can imagine inspiring the Monty Python ‘Sci Fi movie’ sketch. As ever, you are left filled with admiration for Christopher Lee’s ability to treat this kind of material with a gravity and intensity it doesn’t remotely deserve. By the end of the film Lee is participating in expository scenes explaining how the alien invasion has happened which are basically utter gibberish, before running outside to implement his character’s ridiculous plan to see off the invaders (this involves many shots of Lee setting fire to haystacks with a flare pistol), and he genuinely seems to be taking it completely seriously. What a legend. Peter Cushing is, of course, equally good, though not in the film enough – though we do get a marvellous example of Cushing’s wonderful ‘death-spasm’ acting (let’s see Disney’s CGI Cushing do that). Most of the film is fairly competently made, but the script is so thick-headed that it’s more or less impossible to take seriously as a piece of drama, and it’s not even particularly enjoyable as camp entertainment. Night of the Big Heat came out in 1967, coincidentally the same year as In the Heat of the Night. One of these films is a timeless classic that deservedly won critical acclaim and several Oscars. The other one is a dim-witted B-movie with Jane Merrow in a bikini and aliens defeated by their poor grasp of meteorology. You can kind of see why Planet Film Productions never achieved a higher profile.